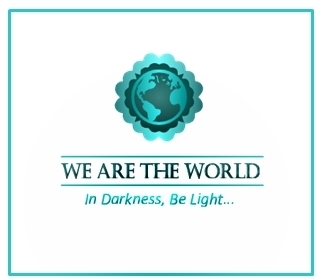 The full title is Not What You Thought? and Other Surprises… A Collection of Short Stories, but that would have made for a seriously long post title, so I hope Paul forgives me for truncating his title. 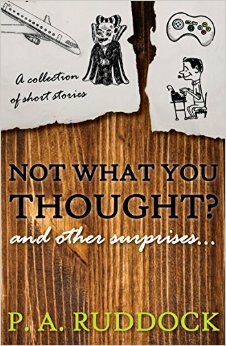 Not What You Thought is a collection of stories ranging from flash fiction levels up to more traditional short story levels all tied together in a neat package themed around leading you down one path before revealing you were actually going down a completely different path all along. 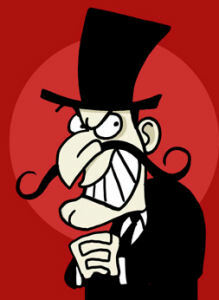 It’s like pure evil in book form, something this guy would write. It’s got some great reads and a few real gems in its digital pages. While I was reading I found myself laughing out loud (a rare thing for me) and pondering the meaning behind the story (a much more common thing for me). At times Not What You Thought is funny, other times it’s a pensive tale of the afterlife, still other times revolve around a dream or the sudden and inescapable desire everyone has to mess with telemarketers. The problem with reviewing stories like this is you can’t even really bring up the plots without giving away the whole kit and kaboodle. Trust me, though, there’s some great stuff in Not What You Thought. As a bonus, it also has some great guest authors (Tom Benson – Lesley Hayes – Peter Nena – John M.W. Smith – Matthew Williams), who put their own spins on the twisty turny tales. Read the first one at least, it’s available as part of the Kindle preview, and you’ll be hooked. Buy your very own copy of Not What You Thought? Great review, and thanks for pointing out that one is available on Kindle Preview. I always forget to try that. Looking forward to it. I don’t know why the free preview thing never clicked for me before, but it’s a perfect way to get a feel for this collection (or any book, really). Hi Eric. On behalf of myself and the other guest authors I’d like to thank you for the name checks in your write-up, but more importantly until he gets here, thank you on Paul’s behalf. He put massess of work, worry, and time into this great compilation. For all those reasons and because he’s just a genuinely nice guy all of us who had work included were delighted to be part of Paul’s debut anthology. I’m hoping he’ll produce another. The amount of work he puts into it shows in the final product, Tom. It’s well-planned and well-executed. I’m looking forward to another, too. I wish I could say I came up with the picture thing, but I stole it from someone else. Can’t remember who right now, but I assure it’s not mine, so steal away! Having read this collection and been thoroughly engaged by it, I can heartily recommend it to anyone looking for something a little bit different to the usual shorts collection. It fun, quirky and the tales captivate just as they should in an anthology. I loved the twists and turns, the often false sense of knowing where a story will go only to be shot down with an ending that leaves you thinking. I love any story that gets me thinking generally. This may be a biased opinion given that I’ve spoken to Paul and sought his guidance on my own anthology (yes, I even pinched a couple of his guest writers in the estimable forms of Tom and Lesley) so I know how much effort he puts into what he does – and how much he worries over the end result. It’s a great little collection and deserves such a review from another established and talented writer. Thank you, Eric. I really appreciate this review. Very good review, Eric, you have covered all the important points to note about this book. My main reason for complete bafflement still remains, and it is this; why doesn’t Paul write more for us? Because here is a talent that is well worth developing! Anyway, now that we have seen him at work maybe he will lose his shyness a bit. I am so glad you liked the stories. I think Paul’s a pretty busy guy, but he’s working on some more writing as far as I know.